Photographs from National Register collection and courtesy of Historic Bethlehem Inc. 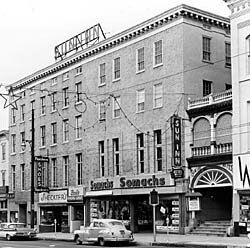 Photograph courtesy of Historic Bethlehem Inc. The 1758 Sun Inn was a successful 18th-century inn, constructed by the leaders of the Moravian community at Bethlehem. The inn provided accommodations for merchants who had business with the community while maintaining a proper separation between the Moravian brethren and outsiders. Because of Bethlehem's proximity to Philadelphia, the Inn housed numerous figures famous in colonial politics, including Generals Gates, Mifflin, and Sullivan, John Hancock, John Adams, Samuel Adams, the Marquis de Lafayette, and George Washington. Bethlehem served twice during the American Revolution, as medical headquarters for George Washington's forces. Following the Battle of Brandywine, over 900 wagons, containing heavy baggage and stores of George Washington's army, were parked in the lowlands to the rear of the Inn. At this time the Sun Inn was heavily burdened by the influx of those individuals fleeing the Philadelphia area in the aftermath of the battle. Another reason for the attraction of so many well-known figures was its high quality of accommodations. In 1782, a traveler expressed his happiness with the Inn by saying that it "is not inferior to the best large inns of England". In 1799 the Inn served as the prison for 17 local "Freis rebels" resisting the unpopular window tax. The original Sun Inn, built in 1758, was a two-story stone building with a mansard roof. In 1826, extensive repairs to the roof were required and a third story, containing 17 rooms, was added. 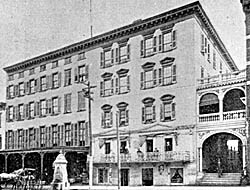 In 1866 the building was enlarged for a hotel and commercial use and bears little resemblance to the original inn. The Moravian Sun Inn is located at 564 Main St., Bethlehem, and is run as a museum by the Sun Inn Preservation Association, Inc. Guided tours are given Monday-Saturday from 11:30am to 4:00pm; Friday and Saturday from 5:00pm to 9:00pm. There is a fee. Call 610-866-1758 for further information.